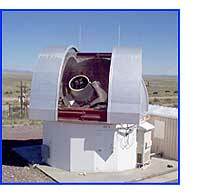 This telescope at LINEAR is used to search for asteroids. A computerized data analysis examines successive pictures for anything that's moving fast -- candidate asteroids. What with the Shoemaker-Levy crackup on Jupiter, and the growing awareness that an asteroid whacked the dinos, it's clear that something must be done about whirling space junk. The current searches focus on asteroids at least one kilometer across. The reason for this focus, says astronomer John Lewis, is that "civilization might not be able to survive a 2-kilometer impact. Morrison, who directed a 1992 survey of asteroid hazards for NASA, says "The actual risk of having your tombstone say 'killed by an asteroid' are at least 10 times as great" for asteroids larger than 1 kilometer, "so certainly it's a proper priority to deal with the larger ones first." Only about 40 percent of the kilometer-plus objects are known; most of the rest are expected to be identified within 10 years. At present, no known planet-killing asteroids in this size range -- or any size, for that matter -- is on a collision path with Earth. Still, a 300-meter object might have a global impact, causing a week or two of climate disruption and could kill crops in the northern hemisphere if it struck while crops were growing. Morrison agrees "It might be nice" to track smaller objects, but searching for objects like the 50-meter asteroid that devastated part of Siberia last century would be a big job. Asteroid numbers are inversely related to size, which is a fancy way of saying that most are small. If you decrease the size by a factor of 10, says Gehrels, the population grows by a factor of 100. To Lewis, that means that the cost of discovering and tracking the smaller --- but potentially deadly -- asteroids would be, well, in his words, "astronomical. It's ridiculous, would require mobilizing the armed forces of the world to search for them." Lewis adds that while many people may die over the next million years due to impacts, many more will die from other causes. "If your sole concern is avoiding destruction of global civilization, you can limit your search for things that are easy" to see. Objects that are 500 meters and up in diameter are big, relatively rare, and large and bright. Let's repeat. No known asteroid is aiming for us, but 60 percent of the largest ones remain undiscovered. Still, Lewis expects that the present search for Earth-killer asteroids should identify about 90 percent of the large, near-Earth asteroids in the next 20 years, so "Basically, you have eliminated the [catastrophic] hazard within a fraction of a lifetime." However, Gehrels maintains that while the original identification is under control, money is lacking for following the orbits of faint, newly discovered asteroids. Many of them are tracked by amateur astronomers, who lack telescopes of sufficient size for the job. An asteroidal bolt from the blue could even be interpreted as a nuclear strike, possibly setting off a retaliatory strike. If, for example, Karachi, Pakistan, were to be obliterated by an asteroid, would the Pakistani military wait for confirmation, or strike India first with its nukes, and ask questions later? That's a nice segue into one proposal -- deflecting asteroids with nuclear bombs. The idea is not to disintegrate the asteroid, but rather to cook one side so hot that lots of material would vaporize and shoot off into space. In accord with the laws of mechanics, that motion would beget an equal and opposite motion, altering the trajectory enough to miss Earth. Depending on the accuracy of the orbital predictions and explosion, it might be best to strike an asteroid millions of miles distant, at which point a gentle nudge would have the most effect. We won't get into the geopolitical impact of such a system, which has already aroused controversy because it involves using nuclear weapons in space and may contravene the Anti-Ballistic Missile treaty. We got to wondering. Are the optimists and pessimists actually talking about the same hazard?